Since we are trying to eat healthier, I made Shaun lunch to take with him today. Somehow, I think we need to get his cholesterol down. 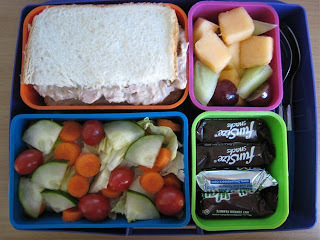 He has a tuna salad sandwich, a fresh salad with lettuce, cucumbers, carrots and fresh tomatoes from my mom's garden, fruit salad and a few mini candy bars as a treat. Much better than fast food in my opinion.